The Gear S2 removes features and focuses on refinement, and the result is Samsung's best timepiece yet. The most remarkable thing about the Samsung Gear S2 is the path that led to its creation. 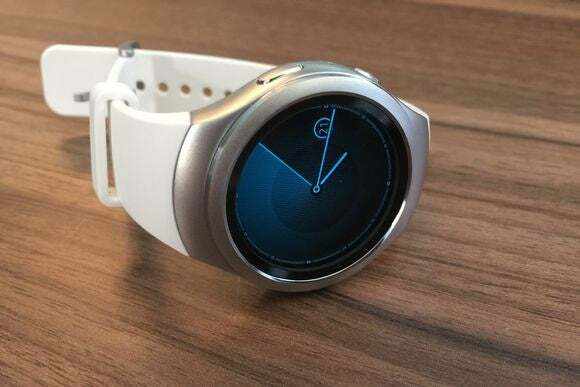 Between September 2013 and November 2014, Samsung released six smartwatches, many of them completely different from one another, and most of them not good. Last year’s Gear S was a low point, looking somewhat like one of Dali’s melted timepieces with disorienting software to match. That product is a $300 smartwatch called the Gear S2. While it’s still far from perfect, it’s by far Samsung’s best smartwatch, and a solid foundation on which the company can build its wearable future. One thing I’ve realized lately about smartwatches is that it’s possible for them to look too much like traditional watches, to the point that they seem like cheap imitations. The trick for smartwatch makers is to straddle the line between tradition and distinction, all without coming across as overly geeky. To my eye, the Apple Watch is the first smartwatch to pull this off, but the Gear S2 is the first round smartwatch to do the same. The review unit Samsung provided is a silver stainless steel model with a white elastomer band, and what stands out is how it’s free of any lugs, crowns, or etchings on the surrounding bezel. It’s clearly not trying to pass as a mechanical watch, and instead has an almost space-aged appearance. And at 42mm across and 11.4mm thick, it won’t look out of place on small- to medium-sized wrists. The trade-off with this design, much like the Apple Watch, is Samsung’s use of proprietary watch bands, rather than a standard 22mm format. I’d argue that this decision makes for a better-looking watch, but it does limit band options to whatever Samsung decides to sell. While the company is working with designer Alessandro Mendini on some funky-looking bands, it’d be nice to see some basic leather options and additional elastomer colors. Rear clasps pull back to release the Gear S2’s proprietary watch bands. Beyond the basic $299 Gear S2, Samsung will soon release a “Classic” variant for $349 that does look more like a traditional watch, and has a leather band. A thicker, larger 3G version is also on the way for roughly $350, with all four major U.S. carriers pledging to support it, but we haven’t tried any of these variants yet. When you’re not actively using the watch, the 1.2-inch AMOLED display remains off by default, which to me looks a bit like staring into the abyss. Thankfully, there’s an “always-on” mode that keeps the clock illuminated in black and white. 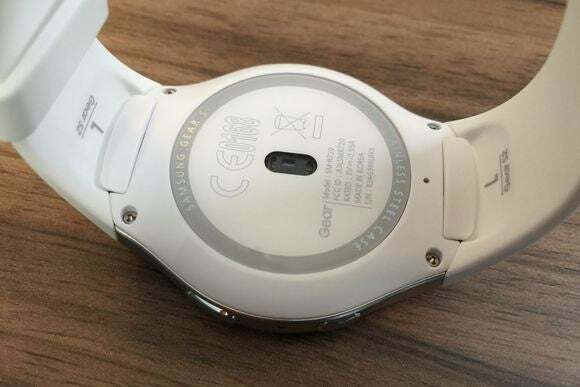 This does carry a significant battery penalty, though: Whereas the Gear S2 lasts roughly two days normally, with always-on mode it just barely survives morning to night at 60 percent brightness. The Gear S2’s raised circular bezel isn’t just cosmetic. 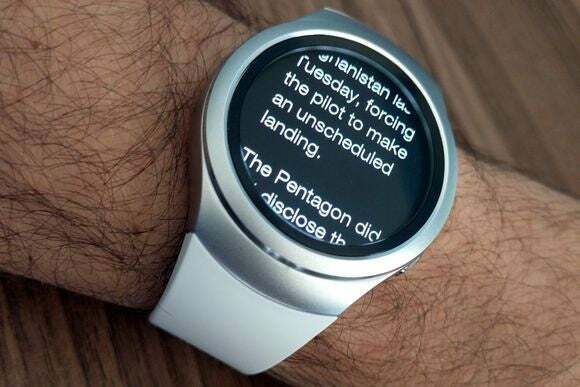 It also comprises the watch’s most unique feature: Give it a twist, and you can scroll through messages, cycle through watch faces or widgets, and control various knobs within apps. You can rotate the bezel endlessly in either direction, each twist moving in 15-degree increments with a satisfying snap. A cynic might see this bezel as mimicry of the Apple Watch’s Digital Crown, but it’s mostly an improvement for the way it works in harmony with the software. 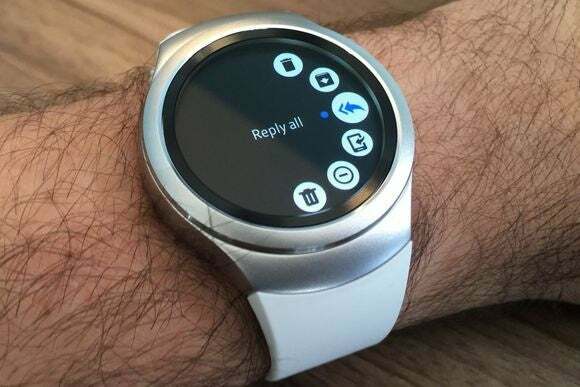 In Samsung’s Tizen-based operating system, twisting counter-clockwise from the main watch face takes you to notifications. A clockwise twist cycles through informational widgets, such as weather, music controls, and fitness data. 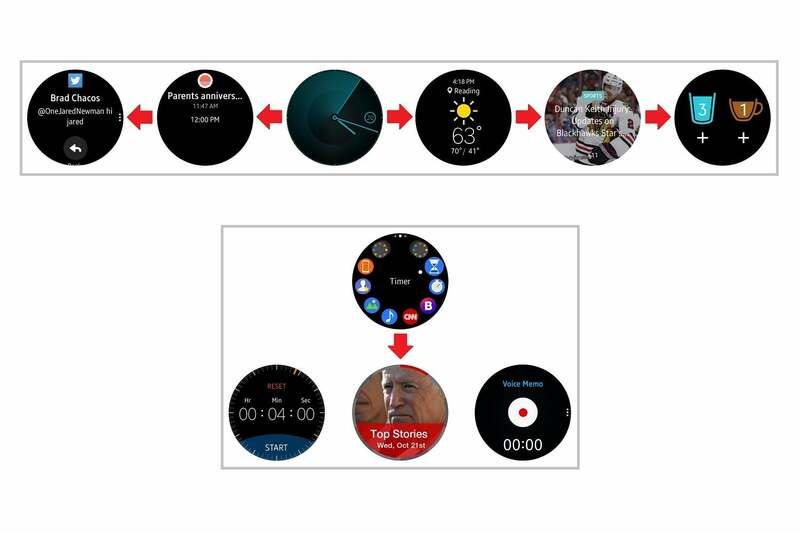 Twisting the Gear S2 bezel cycles through home screens (top). A button on the watch’s side opens the app launcher (bottom). This top-level menu system is often the best way to interact with the Gear S2, largely because the bezel is so fast and accurate at moving between information panes. I rarely even felt the need to dive into the watch’s full-blown app launcher or contacts lists. The bezel’s only downside is that it’s slow at scrolling to the bottom of long emails or lists; in these cases, you’re better off just swiping your finger. While the rotating bezel is the Gear S2’s big-ticket feature, the software is also packed with little improvements, showing how Samsung has learned from past mistakes. Animations are fast and smooth now, and notifications are actionable, just like on Android phones. That means you can delete emails, respond to Twitter mentions, or hit snooze on an alarm straight from the watch. Fitness tracking now includes the occasional reminder to get off your seat, and there’s a handy home screen widget for counting water and coffee consumption. The only notable omission on the fitness front is sleep tracking. The Gear S2’s actionable notifications mirror those of Android phones and watches. The keyboard isn’t a great a primary input method, but useful for editing voice replies. Perhaps the most important improvement of all is that the Gear S2 works with many Android phones, instead just Samsung ones. There’s not even much of a penalty for having a non-Samsung phone, beyond preventing you from checking out at the cash register with Samsung Pay. While there’s no iPhone support for now, Samsung has said it’s considering the possibility. So far, we’ve established that the Gear S2 is an attractive smartwatch with a strong interaction model and meaningful software improvements. Why isn’t it as perfect as Samsung wants it to be? Partly, it’s because of some little things Samsung still needs to address. For instance, there’s no way to remain focused on a particular app or widget when the screen turns off, so you always end up back on the clock screen after a several seconds of inactivity. Notifications are easy enough to dismiss, but there’s no way to get them back if you’ve swiped one away by accident. The process for installing watch apps can also be clunky, sometimes requiring you to install an app on your phone, plus a separate companion app that communicates with the watch, plus the watch app itself. I’ve also run into a strange glitch, in which the Gear S2 requires a “light” factory reset when it loses its pairing with my Nexus 5X. This wipes the watch and restores previous settings from the phone, a process that takes five minutes or so and requires you to sign back into a Samsung account. I’ve yet to hear back from Samsung on why this is happening. 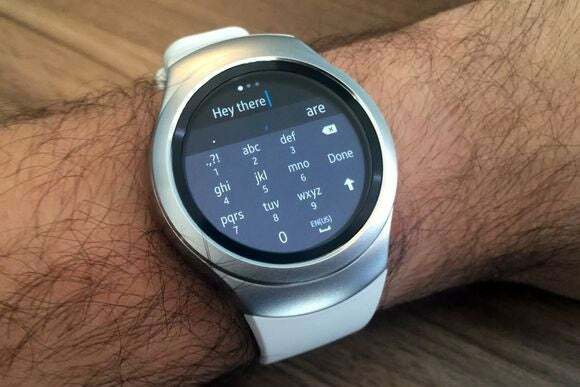 The biggest problem, however, is the lack of apps that take advantage of everything the Gear S2 offers. Not including watch faces, I count fewer than 80 apps in Samsung’s store. Of those, maybe a dozen are actually useful. And of those, only a few are optimized for the Gear S2’s round display and rotating bezel. So far, I’ve only found one good app that offers a widget for the Gear S2’s home screen. Here’s what happens when a watch app doesn’t account for round displays. The good news is that the Gear S2 is a useful smartwatch regardless. If you want a timepiece that handles notifications, communication, fitness, and some handy widgets for music and weather, the Gear S2 works well enough out of the box. Certainly, some people enjoyed Samsung’s previous smartwatches—just read the many angry comments on my Gear S review for proof—and they may be disappointed by the Gear S2, which can’t make phone calls and lacks built-in GPS. While Samsung is bringing those features to a thicker, larger, 3G version of the Gear S2, even that won’t have the same app selection or full-blown web browser. In other words, it won’t feel quite like strapping a smartphone to your wrist. But for most people, I’m guessing Samsung’s newfound restraint will prove to be a good thing. Instead of continuing down the path of piling on more features, Samsung backtracked to make sure it got the basics right. Although the Gear S2 hasn’t reached smartwatch perfection yet, at least it’s on the right course to get there. This story, "Samsung Gear S2 review: Stepping back to move forward" was originally published by Greenbot.